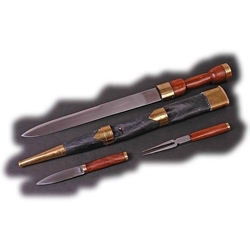 Styled on the military regulation dirk and much favored by Scottish Bandsmen, this impressive 18" full size Scottish Dirk with Fork and Knife has a polished 12" steel blade etched with traditional Scottish thistle and foliage decoration. A black leather covered scabbard, capped with gold plated mounts, chiseled in high relief, topped with military regulation. Comes with fork (6 3/4" long) and knife (6 1/2" long) as shown.